From Surah Al-Mujadila to Surah An-Nas. Comes in 2 Sizes. This is Amma, Tabarak and Qad Same'a parts of the Tajweed Quran, parts twenty eight, twenty nine and thirty, which starts from sura "Al-Mujadila " till sura "An-Nas". 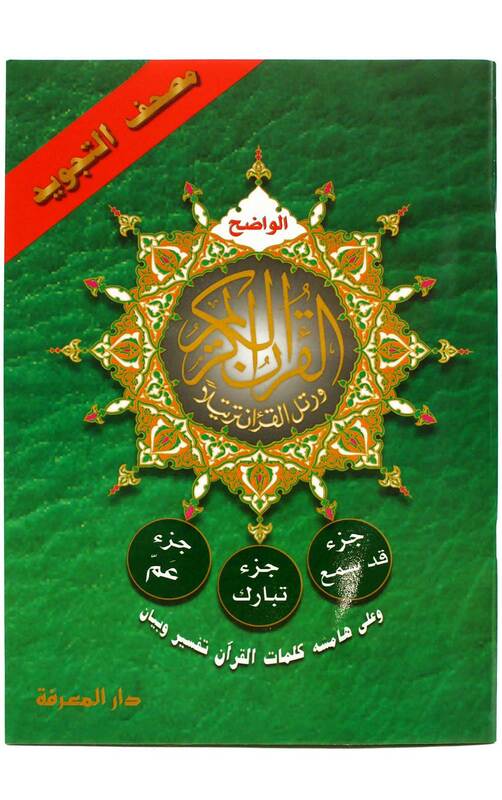 Considering that this book contains small surahs; this item is a perfect start for kids, beginners and students. This product comes in the standard portrait form, combining the three parts (28, 29 and 30) with a nice glossy soft cover. Each page contains 15 lines as any standard Quran, with an interpretation of selected words placed on the margins on every page.